Outrage first erupted after two separate but particularly belligerent disruptions of pro-Israel UC student events took place in May 2018. On May 7, College Republicans at UCI, hosting Israeli reservists, saw their session shattered by a sudden invasion of bullhorn-wielding BDS advocates chanting anti-Israel slogans. A few days later, on May 17, Students Supporting Israel at UCLA sponsored an outreach panel discussion with indigenous students only to have it violently shut down by nose-to-nose BDS harassment. Both dramatic disruptions were captured on viral video. For Jewish students and legal defense groups, these two egregious incidents were the tipping point of campus harassment at UC schools. The consensus among Jewish leadership and students was that the school administrations had consciously created a permissive anti-Israel atmosphere so toxic that it virtually encouraged increasingly severe forms of anti-Israel harassment. At UCI, the video shows bull-horn disruption going for several minutes as police and university administrators watched. Initially, both UCLA and UCI administrations declined to refer the incidents to the police for investigation and prosecution. This reinforced the belief that the permissive environment on campus actually promoted harassment as a bizarre species of free speech. Moreover, the legal system itself permits the universities to exercise broad discretion, allowing them to simply look the other way. California’s unusual state laws juridically enable the universities to potentially create a double standard and promote unequal justice. The UC administration can decide who shall be referred to its own police force and who shall be given a pass, or subjected to so-called “academic discipline.” No referral to the police means no referral to prosecutors. Observers believe a built-in conflict of interest and a system of unequal justice can emerge when publicity-shy media relations managers can give campus police their marching orders. 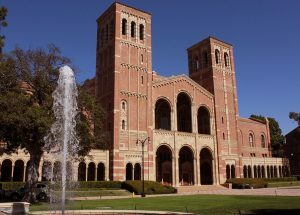 The UCLA event was sponsored by a coalition of groups including the same Students Supporting Israel chapter that had been harassed last May. Rabbi Abraham Cooper, associate dean of the Simon Wiesenthal Center, attended to kick off the livestreamed event. At UCLA, it was a new day. When campus police learned of the event, they took immediate steps to ensure it would proceed without interference. Two UCLA PD officers were dispatched to the event itself, both highly trained and deeply conversant with the pro-Israel and Jewish communal scene. A representative of the administration joined the officers. The police and administration declared that, in the event of a disruption, perpetrators would be given one warning to immediately cease and desist; and if they did not, “they will be arrested and charged.” This, coupled with the LA Prosecutor’s watchful eye, combined to insulate the event from criminal disruption. Thus, thanks to leadership from StandWithUs and the Brandeis Center and the courage of the students who stepped forward, combined with intense media scrutiny, the rate of acceleration of anti-Semitism on campus and especially at UC colleges has been slowed – at least for the moment. This is an edited version of an article that appeared in Algemeiner on January 17, 2019.